I was working on what I thought would be a pretty quick update to my 1952 high numbers post, which has now turned into a seven course meal that will be taking its sweet time to write itself and so was suddenly in need of something to blog about to end February with. 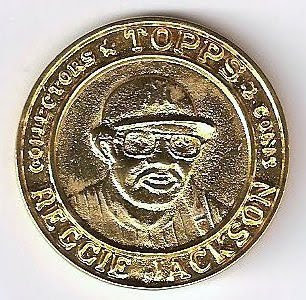 As luck would have it I received via e-mail scans of a couple of 1980 Topps Baseball Coins that completes the known assortment of "metals" used in their production and puts us at the other end of the Topps golden era while I get my notes in order on the highs. To quote Homer J. Simpson "oooh, shiny!" 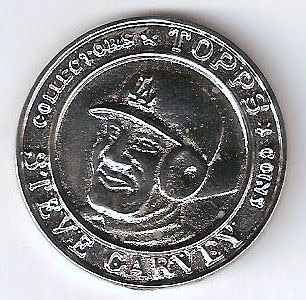 You can clearly see now that the Carew coin featured previously is of the "bronze" variety, as is the other Reggie. Bronze looks to be the poor stepsister to the gold and silver, it's luster is faded compared to the other two. I have to say the gold looks real sharp. We remain at three players in the known checklist and now have all three metals accounted for. Perhaps one of the "holed" versions will show up i my mailbox someday. I also wonder if all players come in all metals or not. More data is needed but that might be tough with these bad boys. I haven't really been a wholehearted embracer of the various Burger King cards Topps was rolling off the presses in the late 70's, probably for the same reason I don't really take to the mid 70's Hostess cards (a Topps production photo-wise)-they just seem like separate food issues. There is a story worth telling though concerning the most valuable of the Topps produced Burger King cards-#23 in the 1977 Yankees set, namely one Lou Piniella. I looked on Ebay for a scan, that was the only one for sale. I'll get into the vagaries of the different BK sets eventually (maybe) but the '77 Piniella appears in the first set Topps produced for the home of the Whopper. The BK cards resemble the regular issue Topps cards for the five years they were issued but sometimes baffle novice collectors since many of the specialty cards have the same fronts and backs as the normal Topps cards but with their own numbering, usually from 1-22. The '77 Yankees set was intended to have 22 cards but it took the intervention of George Steinbrenner to have a card of ol' loudmouth Lou included. To hear Sy Berger tell it, in an articleI found online at Google Books (from an old edition of Inside Sports magazine), the scuttlebutt in Spring Training was that Piniella was going to be traded and Sy made the executive decision to leave him out of the set. To quote the article Berger stated Piniella got off to a hot start and "George Steinbrenner called me up and said there was no way we could distribute Yankee cards without Piniella." It must have been a heated discussion as the article notes Berger winced when recounting it. The Piniella card sells for a multiple of about 100 times what a common goes for and does seem to be in short supply. Not scarce but perhaps a hoarded card. There is some more here, on the Gothamist that is well worth reading (as is Gothamist generally). I was sitting around my study the other day, idly surfing the web when I happened upon a question concerning distribution of the 1952 Topps baseball high numbers. I pulled out my handy-dandy Sport Americana Team Baseball Checklist Number 3 (circa 1987 and one of my most useful references) and found a neat little pattern I thought I would share with you all today. 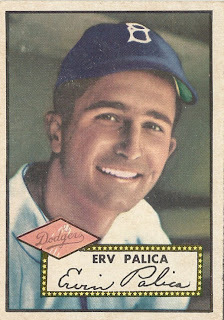 Now, 1952 Topps is one of the three or four truly iconic baseball sets and indeed I have blogged about it previously. Others have created websites and written studious articles about it and I hope to do an exhaustive study someday. But I haven't seen too much about where it was distributed and belive I can offer some insight. Look at a city breakdown and the answer to the distribution question may be apparent. There are 97 high numbers, of which 35 are from the three NY teams (16 Bums, 12 Giants and 7 Yanks), and 14 Boston players (9 Bosox and 5 Braves) which means over half the high numbers are from just two cities. Pittsburgh gets 10, Cincy gets 9 as does Chicago (all Cubs-there are no White Sox in the high numbers). That's 77 cards for five cities covering 8 teams. The two Philly teams total 7 cards (4 Phils, 3 A's), St. Loo has 7 as well (4 Cardinals, 3 Browns). Cleveland and Detroit between them get 5 (3 and 2 respectively) and the Senators got 1 (a very lonely Connie Marrero). So we have 20 cards representing five cities and 7 teams on the opposite end of the spectrum. Based on that the New York City metro area, Boston and the non-Great Lakes Midwest cities of Pitsburgh and Cincinnati must gave gotten the highs, plus I have to think Chicago did too, despite there not being a single Pale Hose to be found. Indeed, there was a big find of high numbers in Boston by Alan Rosen in 1986. Some must have made it to Philly and I presume St. Louis was too far away for the distribution to make it there in time for any meaningful sales to develop. If there was Philly distribution then maybe cards made it to Washington DC but they probably didn't with only the one Senator. I also can't see any city west of the Mississippi getting highs in '52. Upstate NY and Canada got the high numbers and there have been a few finds in those remote (for MLB) areas over the years, possibly because some were printed in upstate New York and with the eastern Great Lakes distribution channels in Detroit and Cleveland likely gone they had to be dumped somewhere. 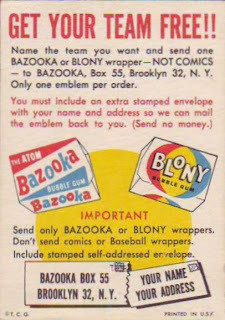 Hobby lore dictates some were issued with 53's the following year or at least in '53 wrappers (making them possibly the first Topps rewraps) and I believe the remainder of the cards were either warehoused or sold to promoters of carnivals and arcades on a bulk discount basis. And we all know the story of Sy Berger riding out to sea with a garbage scow as all the leftover high numbers were disposed of off the shores of New Jersey in 1960 to clear up space in the warehouse. Ol' Erv could a been a contender if that garbage scow had never left port in 1960. 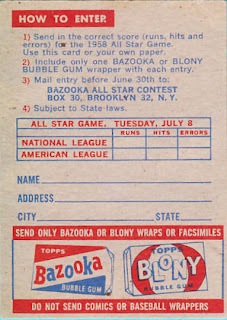 But would we have then have had the hyper-attentive media coverage of the '52 Mantle's upward price escalation thirty years ago that fueled the growth of the hobby? Credit to the wackypackages.org website on those two-check their site out there is some fab stuff there! Think the guy behind the desk is Woody? If not, there are not too many other choices! 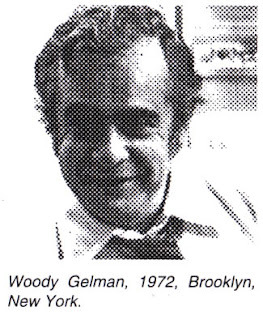 Woody Gelman was an interesting dude and I've posted the link to his Wikipedia entry before but another click is in order, even though it does not address his role with the Card Collector's Company, which was instrumental in developing the modern trading card hobby. The Brooklyn notation on the top scan of Mr. Gelman above is providing me more fodder for a post or two on Topps production facilities. While they moved most of their operation to Duryea, PA in 1965 a corporate office still was maintained at Bush Terminal in Brooklyn for many years after. Since I've been trying to determine the various locales and sub-contracted firms that did some of the pre-Duryea work (and some post-move work as well) as well as obsessively trying for thirty years to suss out the secrets of Topps uncut sheets, this upcoming series may well be a collaborative, post-as-we-go effort. So if anyone has good, concrete evidence of how Topps printed cards in the golden years, fell free to shoot me a line. NOTE (4/8/10): Woody Gelman is not shown in the Art Dept. card. More details here. 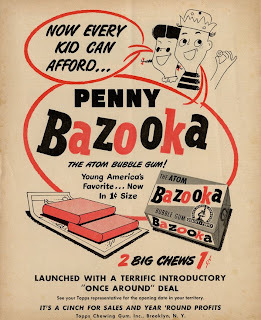 A while back Jeff Shepherd sent along a really nice scan of a 1949 Bazooka ad which I was saving for a rainy day. Well, guess what--it's raining here at the main Topps Archive Research Complex! Actually, it's turned to snow and I'm typing this in my study but you get the idea. I would say that is from the 60's or possibly early 70's and probably after Topps moved everything to Duryea, PA. By the way I found that at a site called www.brassdragon.biz although they seem to be having some technical issues, so no linky dink today. 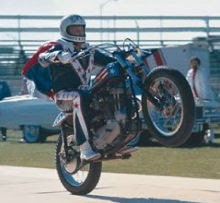 I'll give you this link instead, the first image is a classic! 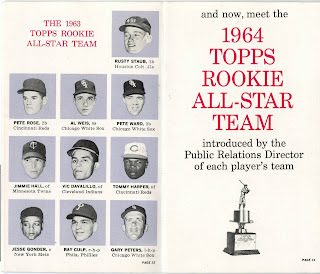 Now, we still need scans of the 1960 and 1965 covers to complete the run of the full-paged programs. Does anyone out there have these to share? I'll decipher the back for you. On the left below the PREMIUM RECORDS banner we have some identification of the subjects and some amusing text. Below that we find out this is "# 14 in a series of 18." On the right we have the Grow Power logo which clearly has the old school Topps logo embedded within , plus the year. 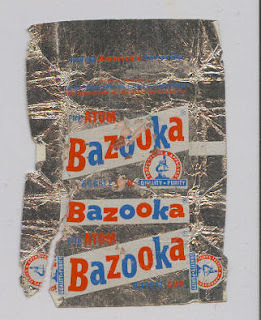 "The rarest card set that Topps ever produced does not appear in any catalog listing. It is the incredibly rare "Topps Teamates (sic)" set from 1970, produced only for the employees of the Topps home office and never distributed outside the company's doors. 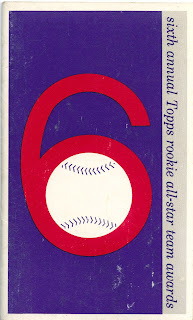 It is labeled "Topps Grow Power '70" on the cards' reverse sides and was probably used to boost the spirit of the troops, promoting the team player aspect. 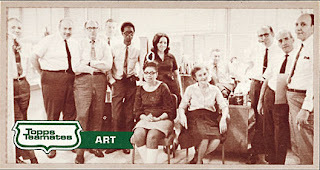 The horizontal cards (approximately 4-5/8 by 2-1/2 inches) came as a set of 18, with each picturing the staff of one of Topps' main departments. The set is missing card #18, and has a duplicate of #4. It is quite possible that the employees traded cards with one another to get duplicate photos of their own department's staff. That scenario is more believable than the idea that Topps couldn't put an 18-card set together without error. Whatever the case, this set's duplicate is of the Art Department, that crazy bunch that was responsible for drawing, pasting, proofing, and polishing all those great sets from the 60's and beyond! It is particularly amusing that the only card in the set with a photographic flaw is that of the Art Department, the very department that was supposed to catch this type of error. The flaw appears to be a flame floating above the seated lady's head. Maybe it was on purpose? Maybe it was the fault of someone in the Production Department? Maybe it was the fault of the same guy that didn't know how to spell "teammates!?!" The absolute best feature of this set (other than the visions it conjures of all those freelance "underground comix" guys working in a button-down environment like this) is that the set features the rookie card of Product Development director Woody Gelman! That's right, he's pictured here with all of his staff, the card guru himself. You've heard all the stories about all of the wonderful products he designed for us. Now you can finally see what he looks like! This set is Topps' version of a High School Yearbook, and it offers a unique look into the offices of 1970. As we are with our own High School Yearbooks, it's probably a sure bet that no one at Topps would ever want these photos to again see the light of day! Near set of 18 (17 different) in NM condition." Woody Gelman is depicted on this baby! I have an idea which one is Woody but want to compare some old pictures first. If you have a clue, chime in! By the way, SCP Auctions had a similar set (maybe complete) around the same time that sold for about double the price of the one above. I doubt more than 100 of these sets were printed, maybe less and find it intriguing two came up for auction in the same time frame. 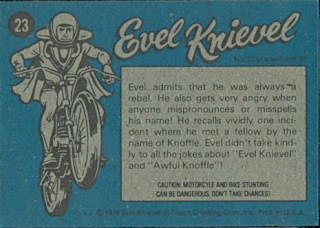 Evel was all over the news in the early 70's, especially for his failed "rocket-cycle" jump of the Snake River Canyon. I'll be back with some original stuff next time but this link was just too good not to share. 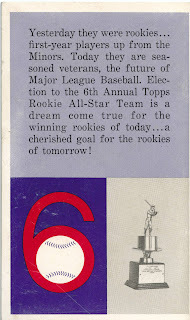 Topps changed their "pushed" inserts for the 1958 baseball and football issues from what had been done in prior years. 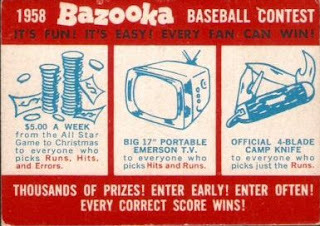 Gone were the checklist cards which would be delegated, with one exception, to the backs of the baseball team cards and the guess-the-score contests of '57 had been reduced to divining the result of the upcoming All Star Game. 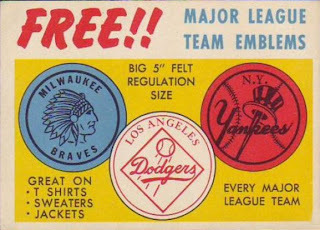 1958 Topps baseball deserves an in-depth look down the road as there are complexities within that far too tangled to reveal here today. 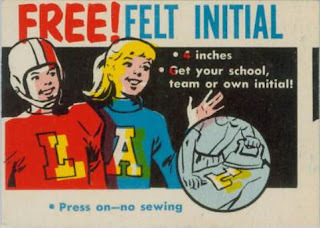 A premium was offered via an insert card as well, reprising an experiment from 1956, of which more will be written another day as well. Today campers, we look at those insert cards, couresy of some scans filched from Ebay. In case you were wondering, the AL beat the NL 4-3 in a closely fought contest in Baltimore, in a game featuring 13 hits, all of which were singles! 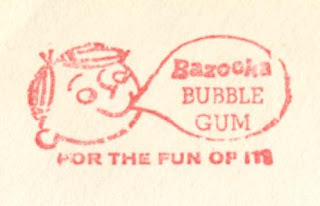 You can see a sample emblem over at the Old Cardboard magazine website. 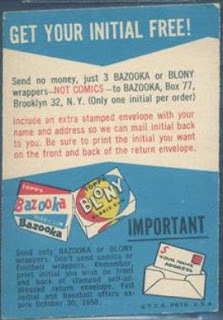 The 58's reflected the new cities when compared to an earlier issue and also hawked the Bazooka and Blony brands. As mentioned above, the 1956 emblems will be addressed another day, as will their antecedent, the 1952 emblems. 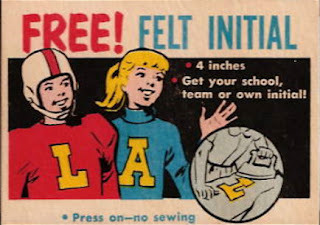 As always, the football insert is much tougher to find than either of the baseball ones.